IRVINE, CA—Hotel Hermosa reopened after 11 months of extensive renovations. 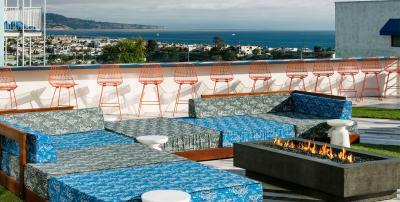 The refurbished hotel is located in Los Angeles’ South Bay at 2515 Pacific Coast Hwy. The property has 81 guestrooms and loft suites. The back patio, also known as “The Yard” features pool tables, a bocce court, giant Jenga, fire pits, HDTVs, lounge seating and bar stools, umbrellas and ocean views. A direct dial “Bat Phone” allows guests to order drinks from the wine and liquor store across the street from the hotel. Local restaurants also deliver to the property. Public spaces were also reinvented, including the new lobby featuring streaming WiFi, plug-and-play furniture, a fire table and public workspaces. The third floor features a sea-monster light installation, while the second floor features a “Before I Die” chalkboard wall. The previous gym was transformed into a mini yoga studio where instructional videos play every hour with views of the ocean as a backdrop.